I couldn’t have timed my trip to Bend more perfectly. The locals said they hadn't seen this much snow in town since 1993. Or was it 1995? The years were mixed up, but the point was that town hadn't experienced snowbanks this tall for decades. The weight of the two feet of snow caused the roof of the elementary school gymnasium to collapse. (Thankfully, no one was in the gym when the roof fell.) Shipments of food and mail were delayed because trucks couldn't cross any of the passes. When I pulled off Highway 97, the streets, cut from snowbanks and bumpy from the ruts of thousands of chained tires, felt and looked like wormholes. The local tow company told the Bend Bulletin they fielded about 100 calls a day from drivers stuck in the snow. 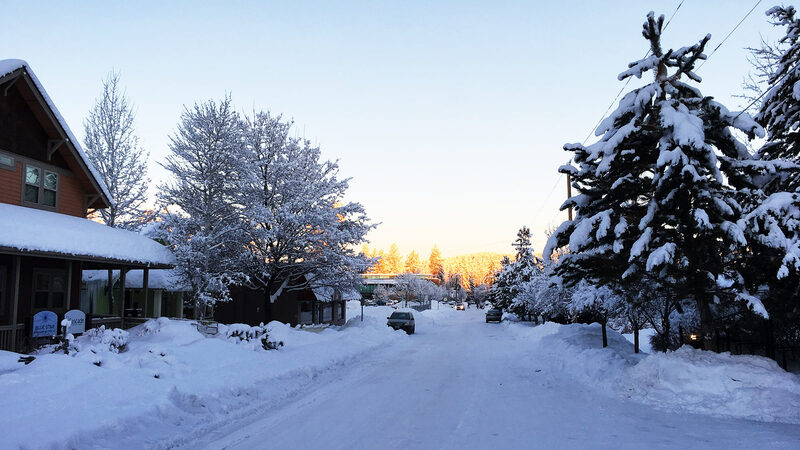 The storm had had its way with Bend and a dense fog still lingered over town, but as soon as I drove up Cascade Lakes Scenic Byway to Mount Bachelor Ski Area, the clouds gave way to a crisp, vivid blue. 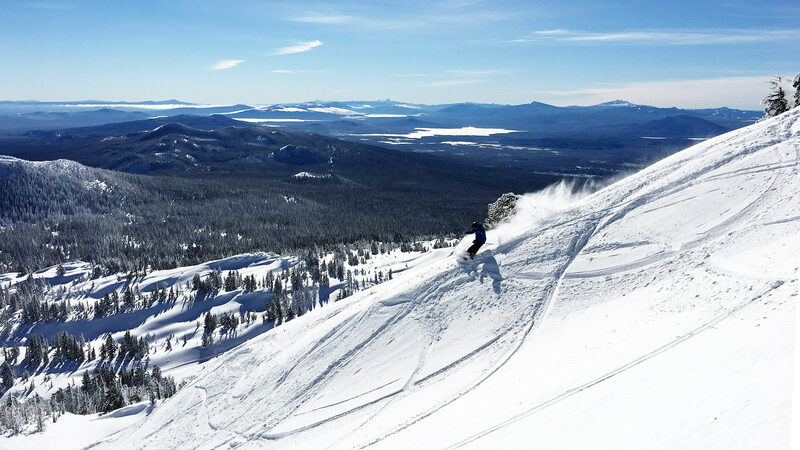 I stepped into my skis at 1:15 p.m., the precise moment when ski patrol dropped the rope to the Summit Chair, a four-pack that drops skiers at the near-summit of Mount Bachelor, and serves up 360 degrees of access and 3,000 vertical feet of terrain. With a population pushing 90,000, Bend is a perfect size. It's a place where you could easily settle into a life of the outdoors. For the next three days, I indulged in all that Bend has to offer: good skiing, good food, good coffee, good beer, all with good people. This much snow is not normal for Bend. But it is for Mount Bachelor. If, like me, you arrive the day after a storm, and if, like me, Summit just popped, head straight there. This is the chair that Bachelor hangs its hat on. It takes you to the top of the volcano. No matter where you go, a cat track draws a circle around the base of the entire mountain to catch you and take you back to the chair. What's more, there's really no need to fear getting cliffed out, or suddenly finding yourself scared shitless on top of something you didn't plan to ski. Bachelor is not that kind of mountain. It's a mountain you surf. The wind sculps scalloped plates, wavy lips, and big dunes. Mellow cornices hang over powdery cups. It actually felt like a snowboarder's mountain because of all the natural terrain-park-esque features. But channel your inner Sage Cattabriga-Alosa—who sees mountains like a piece of blank canvas (and also recently moved to Bend with his wife and twin daughters)—and turn the mountain into a playground of banked turns, jibs, soft poppers and pillows, goat trails, and loop-de-loops. 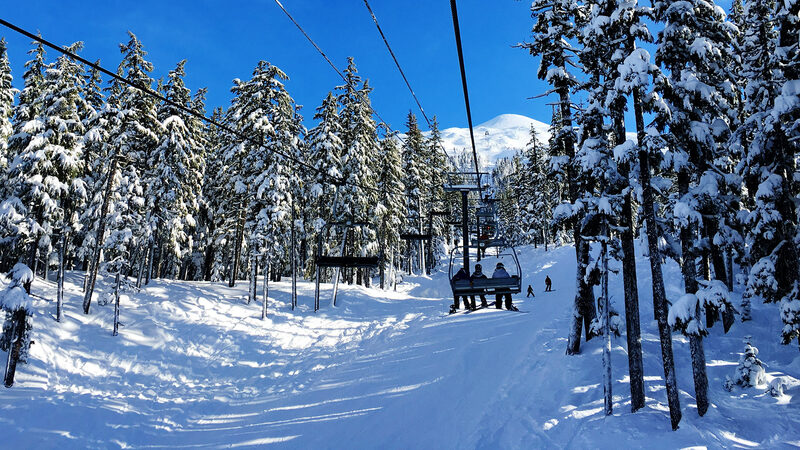 The Northwest Express climbs almost 2,400 feet on the backside of Mount Bachelor. If your legs are as tired as mine were, you're going to need a beer. Being a town full of outdoors people who like to share a brew after an adventure, Bend is also a town full of craft breweries—22 in total. No doubt you've heard of Deschutes, whose original brewpub is still pouring drafts downtown. Take a tour of Deschutes' production facility to learn more about the brewing process and why the company is one of the best places to work in the country. But also try Crux Fermentation Project and 10 Barrel, where I happily landed for aprés with a pint of Basic Batch stout and a plate full of fries smothered with a blue cheese cream sauce, bacon, chives, and I'm not sure what else. It was heavenly. Snowshoeing at night with Wanderlust Tours through a forest lit up by a full moon. Yeah, I know, snowshoeing is not your thing. But trust me when I say this tour was well worth the late-night motivation. Bring a buzz and an open mind. I followed a soon-to-be-certified Master Naturalist through a silent nightscape. He gave everyone on the tour a headlamp, but I never turned mine on. The moon was so bright the snow sparkled. As our Master Naturalist led us around an old Hemlock forest, he shared his intricate knowledge about poisonous moss, different kinds of lava, and in the sky, the difference between constellations and asterisms and how stars become red giants. His explanations of our environment sounded like poetry. 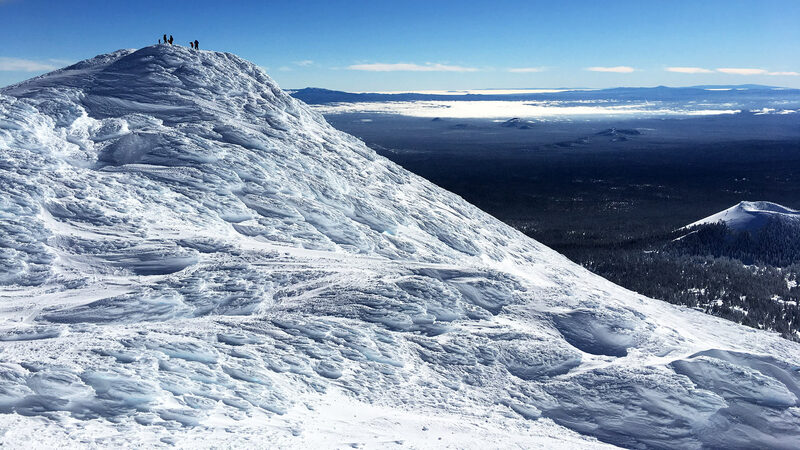 A reminder that you’re skiing on an exposed volcano that catches the wind. Once a Catholic schoolhouse built in 1936, McMenamin’s Old St. Francis School is now a hotel with a brewery, theater, cigar bar, and a soaking pool that is not to be missed. The place has a dark, twisted, fantasy vibe to it, like you'd imagine Harry Potter’s Hogwarts to be. Dozens of chandeliers and custom light fixtures of all sizes, colors, and shapes light up the ceiling and walls. The Saints keep watch from their portraits on the wall. There are even secret rooms. I found two by pushing on the wood panels. And then there's the soaking pool, which makes you feel like you've stepped into a Greek myth. Sculpture fountains spit water into the warm pool. Mosaics line the walls. And paper lights in the rising steam gave the illusion of being outside under a dark night sky. The Victorian. Or Vic's. I'll keep this short: Kobe Beef Eggs Benedict. Enough said. Oh, and I hear they serve a really good Bloody. Today is more relaxed, so take the morning to explore some of the other chairs on the mountain. Like the new Cloudchaser lift, which Bachelor opened this winter to give access to another 635 acres, mostly glades. Or the mellow terrain off of Sunrise. Or swing by Carrousel, a free chairlift meant for people just learning how to ski. Another reason to bring your favorite aunt who has never skied before: Pay $225 for five lessons, including lift tickets and rentals, and after completing the course get a free 12-day ski pass. Eventually, you'll want to get back up to the Summit chair, where wind erased yesterday's tracks and the snow is smooth and buffed. Mount Bachelor is a mountain you surf and slash, like Stirling Cobb. In the courtyard behind Crows Feet Commons, Bend's ski shop. The ski resort was throwing a party. Deschutes poured beer. A local taco truck served up food. And two bands took the stage. In true mountain-town style, the stir-crazy locals showed up in beanies and puffies to catch up, dance, and throw back a beer or two. Oregon being friendly, visitors were welcomed. After two days of hanging around in my ski pants, I needed a meal where I didn't feel like such a bum. We went to Zydeco, where a bottle of red, a beet salad, and a plate of braised short ribs and mac ‘n cheese did the trick. The Redfish comes highly recommended, too. You really can't go wrong in Bend. Like Portland, it's a town you can eat your way through. But do stop by Sparrow Bakery for a bacon, egg, and arugula sandwich on a fresh-baked croissant. You deserve it. For more travel information, check out Visit Bend.